Marcel Luske, the well-known “Flying Dutchman” of international poker, has filed a lawsuit against former sponsor PokerStars over that site’s alleged use of a variation of a set of tournament rules created by Luske and his FIDPA [Federation Internationale de Poker Association] organization. Luske is represented by Kerry J. Doyle of the Las Vegas law firm of Thunder Law, operated by Doyle and partner Tyler M. Crawford. The lawsuit featuring Luske as a plaintiff names as primary defendants Amaya Services Limited, Rational Entertainment Enterprises Limited, and Rational Group Limited. Several other Stars entities are listed as “doing business as” entities under the Rational Group umbrella. Those entities include Global Poker Tours, PokerStars, PSLive, and Rational Services Limited. The case, denoted A-16-741426-C, was filed in Clark County District Court on Tuesday. The filing requests a trial by jury. At issue are the set of poker tournament rules created by Luske through his FIDPA entity, which he alleges within the lawsuit that he agreed to let PokerStars use in an oral agreement reached in 2014. Per the CDC update, Luske asserted that Stars and Luske reached that oral agreement in 2014, after Stars had initially expressed interest in the FIDPA rulebook as far back as 2012. Luske, who was released from his endorsement deal with PokerStars after several years of promotional work for the company, claims that the current rules being used at PSLive events are a direct knockoff of his FIDPA rules. Compounding the matter is a claim made by Luske that he attempted to license the International Poker Rules to Alex Dreyfus’s Global Poker Index in 2013, but had to pass it up because of his ongoing handshake deal with PokerStars. All of the alleged torts committed by Stars against Luske occurred during the Rational Group ownership of the site, before Stars was sold to Canada-based Amaya Group in 2015. Nonetheless, Amaya is named as a co-defendant due to the alleged ongoing use of the FIDPA-derived rules at Stars-sponsored events. 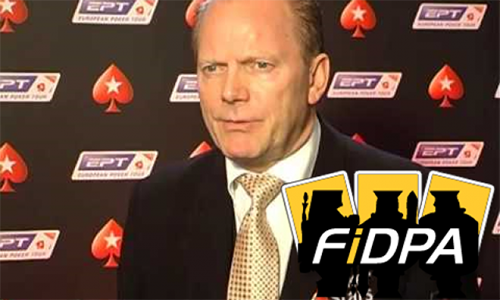 Luske, at various times, has alleged that the International Poker Rules and FIDPA in general have suffered due to host venues preferring rules frameworks that were friendlier to the venues themselves than to the players, in certain extreme situations. Luske has previously cited the widespread acceptance of the Poker Tournament Directors Association [TDA], the group founded by prominent tourney director Matt Savage way back in 2001, as an example of that preference. is established with the support, help and cooperation from industry professionals and players that love the game of poker. FIDPA sells rights to its international-rules playbook for $1,000/year, and claims a handful of endorsing participants. Among the venues listed as using FIDPA rules are the Bellagio in Las Vegas, the Australian Poker League, and the Dusk Till Dawn poker club in England. Neither Luske nor PokerStars responded to a request for additional comment on the legal action.